Who will benefit from this list? Which brands and models did we evaluate? If you are looking to become the ultimate destroyer of plaque and harmful mouth bacteria, you have come to the right place. Sonic toothbrushes are powerful, easy to use, quite interactive, and most of all beneficial to everyday oral hygiene. So, if you think the time to up your dental game has come, this comparison between different sonic models is for you. No time to read the entire post and extensive reviews? No problem! Check out the table below for some quick recommendations, ratings, and pricing. Use the table of contents for quicker navigation around the article! Our list is designed to meet the needs of the average powered toothbrush consumer. Statistically speaking, these reviews are aimed at the 80% of people, or the middle of the curve. We have factored in cost as a practical consideration. However, we do recognize that there are consumers who are willing to splash more money. Hence, we reviewed higher end sonic toothbrush models as well. The phrase sonic toothbrush is widely associated with Philips. It is done right so, considering that the giant Dutch technology company was the first to introduce the sonic models to the market. However, that was back in 2000. Now, they are not the only manufacturers and producers of sonic oral hygiene products. For this reason, our reviews were not limited to Philips’ Sonicare series. Instead, we looked at all current market competitors, such as Waterpik, Pursonic, Panasonic, CUH, Aiyabrush, Foreo, Sterline, and 2Nice. This allowed us to compare technologies, user experience, and customer service around the industry. It also contributed to a more holistic and complete list. This is Sonicare’s first line of offense. Their most dispensable, bare-bone, simple, yet fully functional unit. On a good day, you can get this model for less than $25. NOTE: This is an older sonic model. It is still being sold, and there is still warranty on it. However, we can in no way guarantee how long this will last for. Philips may decide to finally remove this item from the shelves. For now, people seem to love it, so it still stays in production. We found this particular model to be a bit chubby. Perhaps due to its older type of NiMH battery that takes a larger portion of the unit’s body. 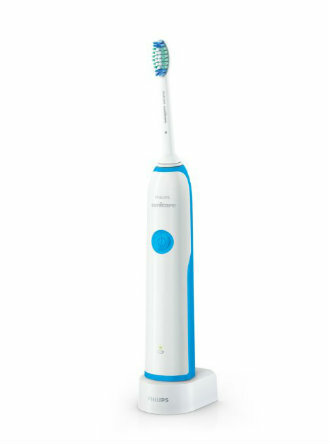 Unlike newer and sleeker models, this Sonicare feels chunky when you hold it. It is also noisier than newer models. It seems to lack the sound suppression technology that more expensive units come with. I think “old fashioned” is a good word to describe the Sonicare Essence. You also only get two options in terms of replacing brush heads: the Standard and Compact size from the e-Series. This is due to the older brush attachment technology that this sonic toothbrush model uses. Namely, you need to screw-on and off the brush head, rather than snap it on and off. Holding this toothbrush will not make you feel as if you are holding Zeus’ lightning bolt. But, if you are on a budget, and you want a sonic model that produces 31,000 brush stroked per minute, this one will do just fine. Use whatever tools necessary to win the war on plaque control and oral diseases. This is the redesigned successor of the above mentioned Essence model. There are some visible improvements, but there are also some gray areas. This newer model costs on average 50% or so more than the older one. Surprisingly, the body remains more or less the same. It is still chubby, round and feels heavy when held. Partially, because Philips has chosen to continue using a NiMH battery instead of switching to a Lithium Ion. In addition, the Essence+ does not offer any improvements in terms of noise reduction and vibration. It still feels and sounds like the older model. The first visible benefit of this redesigned model is its capability to use Sonicare’s interchangeable click-on style brush heads. This gives consumers access to all of Philips’ snap-on heads. At first, it might not seem like a big change, but it actually is. Having access to all varieties of brush heads makes the Essence+ agiler. It can now be used by people with sensitive gums or braces. All you need to do is find a suitable snap-on head and replace the current one. This improved feature also allows the toothbrush to be easily shared amongst family members with different toothbrushing needs. Unfortunately, at this price, the Essence+ only comes with one brush head. You can usually choose between Sensitive, SimplyClean, or ProResults. Any extra heads will have to be purchased separately. Like its predecessor, this model’s vibration speed tops at 31,000 brush strokes per minute. And, it also comes with only one cleaning mode – Clean. Surprisingly, the battery life on the Essence Plus holds only 10 days between charges. This is about 3-4 days less than the older model. Do not forget that this is still considered an inexpensive sonic toothbrush. Especially, in the world of Sonicare where there are models like the DiamondClean that can end up costing you your liver. The 2 Series is Sonicare’s second line of offense. And yes, I am still talking about the ongoing war on plaque control and oral diseases! With this model, we already see some design improvements in terms of weight loss. This is a more comfortable to hold model than the Essence. It feels and looks sleeker and more glamorous. And, it comes in 6 color combinations: Blue/White, Black, Coral, Coral/White, Guacamole, Steel Blue. In case you wonder, I also thought Guacamole was a Mexican dish served with delicious nachos. Turns out it is now also a color. Even though Philips has managed to shorten the overall diameter of the 2 Series, they have still chosen to go with a NiMH battery. This was likely done so they can justify a more reasonable price. Either way, the battery lasts around 2 weeks between full charges. Like both Essence models, this one’s top speed is 31,000 brush strokes per minute and it comes with one cleaning mode. 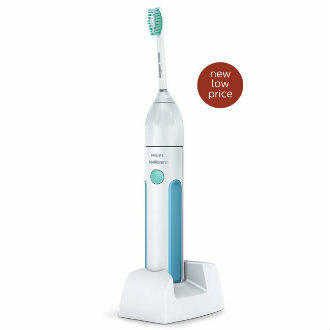 The 2 Series toothbrush comes in a package with the ProResults brush head. However, the full line of Sonicare interchangeable click-on heads are available to choose from. When compared to the Essence models, the 2 Series is a smaller and more convenient to use brush. This is cool. It makes it easier to share with smaller members of the family, such as kids. But, we are not sure if it justifies the higher price. We feel like Philips brought this model to the market in order to fill up a price range. In terms of functionality, this model is no better than the Essence+. It is easier to hold and operate, but at the end of the day, it will deliver the same results, considering it is being used the same way with the same brush heads. 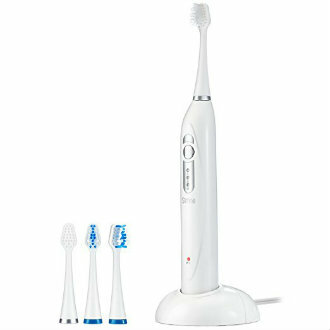 If compared to the higher-end Sonicare models, the 2 Series is still noisy and less refined. Having said that, this toothbrush will not cost a fortune. On average, it sells for about 25% more than the Essence+. Shockingly, Philips is not the only brand that makes sonic toothbrushes. In our quest to finding the top sonic toothbrush models, we came across Sterline – an up and coming dental hygiene brand. It is not easy to spot, because it does not have the same market shares as Philips or Oral-B, but it is definitely out there. They only have one sonic toothbrush, which is a sonic model, and which you can get for less than $45. What we loved about it, is that it is priced as an entry level toothbrush, but it comes with features and options that bigger brands will not offer for less than $80. First off, the Sonic Pulse comes with 6 brush heads. That’s 5 more than what you get from the lower Philips models. You get, 2 interdental, 2 Slimsonic, and 2 professional brush heads. The issue we had, was with switching between brush heads. It is a bit awkward, and sometimes it feels like that head might break if you push it too hard. The toothbrush itself does not breathtakingly eye-catching. It will not give a futuristic look to your bathroom cabinet. But, with 31,000 vibration movements per minute, it will do the job. In addition, you get 3 brushing modes: Clean, Soft, and Massage. That is, 2 more mode than you get for the similarly priced Sonicare 2 Series. The battery will last around 2 weeks if used twice a day with the Clean mode. We only tested the other modes briefly to see what the difference in power was. Considering that Clean was the hardest mode of the 3, we can assume battery will last the same or longer if used with the other 2 modes. Having said that, it takes 24 to fully charge the battery. That is on average 8 hours longer than other more advanced Sonic toothbrushes. Sterline also offers the widely marketed UV clean technology that is supposed to kill 99.9% of bacteria on brush heads. Arguably, once the brush heads are stored inside the case, the UV lights are activated and leftover germs are eliminated. This is something that we are not completely sold on. It has nothing to do with the brand, but with the technology itself. There is very little academic research to support these claims, and frankly, we could not find any that is reliably associated with well-known faculties. Before we dive into our reviews, it is important to make the distinction between sonic and ultrasonic. The two categories are often blended into one, mistakenly comparing them to one another. Even though both types essentially fall under the electric toothbrush category, their functionalities differ to a great extent. Here is some further clarification on that note. A sonic toothbrush produces rapid movements of the brush head that cause vibrations in the hearing (audible) range. The models that fall within this category function at frequencies that range from 200 to 400 Hz, hence within the human hearing range of 20 to 20,000 Hz. This high in amplitude movement equates anywhere from 24,000 to 48,000 brush strokes per minute. In more general terms, this is the commercially accepted standard for measuring the speed of sonic toothbrushes. If you speculated that ultrasonic toothbrushes use ultrasonic waves to brush teeth, you have guessed correctly. Unlike the above mentioned sonic models, a toothbrush cannot be considered ultrasonic unless it can produce a wave at a minimum frequency of 20,000 Hz. This equates to 2,400,000 brush head movements per minute. Our research showed that the majority of toothbrushes approved by the Food and Drug Administration (FDA) as ultrasonic, generate around 196,000,000 movements per minute. This means that they function at around 1.6 Mhz. Unlike oscillating or sonic models, this type uses powerful ultrasound waves to clean below the gum line. To quote Shakespeare and Hamlet, “there is a method to his madness”. Hopefully, you will find our reviews to have a happier ending and to be a notch less melodramatic than Hamlet. The model that offers the most useful features. Must have 31,000 brush strokes per minute. Like many modern day technological gadgets, sonic toothbrushes come with a variety of features. Each and every one of them is being promoted as helpful in regards to oral hygiene. Some modes claim to help you develop better habits while others insist on improving brushing technique and helping eliminate more plaque. Though some of those statements might hold a varying level of truth, we are not here to judge their validity. For the purpose of our reviews, we have considered the average toothbrush user who is motivated enough to brush his or her teeth twice a day for two minutes. Also, check out our top toothbrushes for people with braces, where we use slightly different criteria to define “best”. Charging voltage – We have considered sonic models that can run on 110 – 220 volt electrical systems. This feature is very convenient for people who travel around the world. It is also a simple technology that we believe should be easily implemented in all rechargeable sonic toothbrushes. So, if you don’t have it, you didn’t make Dental Dork’s awesome list. 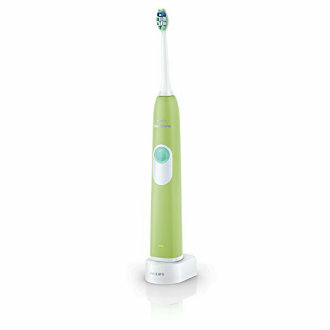 EasyStart – This is a feature introduced by Philips and their Sonicare series. It basically helps new sonic toothbrush users to get used to the high-frequency vibrations by slowly increasing them over time. This is great if you are not used to 31,000 brush strokes per minute. Which you will not be used to if you have been using a manual toothbrush till now. QuadPacer – This is a cool timer that allows the user to split each tooth brushing activity into four. The mouth is divided into four separate quadrants of teeth, two on the lower side and two on the upper side. The QuadPacer signals the user every 30 seconds that it is time to move to the next quadrant of the mouth. This often prevents over-brushing. Divide and conquer! SmartTimer – This timer turns the toothbrush off after 2 minutes of usage. It can be annoying, but then again, all you need to do to continue is press the start button on the handle. This feature is mostly renowned because it motivates people to brush for the entire 2 minutes. We, however, considered it because it can also remind users when it’s time to stop. Therefore, avoiding over-brushing that can cause gum swallowing and bleeding. Excessive Pressure Sensor – Pressing too hard while brushing is a real first world problem. This smart indicator senses when there is too much pressure being applied to the teeth and gums, and stalls the toothbrush for a brief moment. Applying too much force while brushing can lead to a variety of gum-related pain and discomfort. This feature is especially important if you are looking for a more sensitive toothbrush for receding gums. Warranty – Like all electronic gadgets, sonic toothbrushes are prone to failure due to manufacturing defects. One year full replacement warranty is the best we were able to find. For that reason, we set it as a standard for evaluation. Solid Construct – 31,000 movements per minute, plus the user applied pressure, can cause some toothbrushes to crumble and break. So, it is imperative that the body of the electric unit is made of solid material and the brush head attaches well. Extra Brush Heads – Much like manual toothbrushes, the bristles on sonic toothbrushes eventually wear off. So, why not make sure that for the same price you get an extra brush head or two? Battery Types – Rechargeable motor powered toothbrushes come with either nickel-metal hydride (NiMH) or Lithium-Ion batteries. We found that manufacturers do not adhere to one type or the other. Instead, they seem to utilize each type based on the needs of the model. The benefit that Lithium Ion batteries offer is that they are on average smaller than NiMH batteries. This often results in a smaller and slicker toothbrush design. They are also capable of recharging quicker. NiMH batteries, on the other hand, are not only bigger in size, but also tend to gradually lose their ability to fully recharge. A phenomenon referred to as “memory effect”, a situation that does not affect Lithium Ion batteries. In our reviews, we had to give a little bit of preference to Lithium Ion batteries. However, we did not use it as a determining factor. After all, sonic toothbrush models with NiMH batteries are still cheaper. Not every feature is a star. It is our honest view that some modes are simply added in order to justify a higher price. While the brushing performance remains the same. It is entirely possible that we are overly critical of some features. But, when sonic toothbrush prices range from $25 to $250, a more vigorous strategy towards categorization is needed. And, since we are used to sailing against the current, here are some features that we wittingly did not factor in. These are the latest effort of scientists and marketers to get people motivated to brush their teeth more often. Smartphone apps allow users to connect their toothbrushes to their phone devices and keep track of brushing habits and techniques. Most applications are quite interactive and offer high and low score based statistics on brushing performances. The ambiguous and scientifically untested thesis is that such apps help develop long-term discipline. Our view is that these apps are fun, but for a short period of time. After a while, they become repetitive and monotone. So, if a person’s attachment to tooth brushing is associated with the app, it will quickly disappear. Therefore, not creating long-term discipline. It is remarkable that new sonic toothbrushes come with 5 or even 6 brushing modes. We understand and acknowledge the need for a more sensitive brushing mode. Some people do have more vulnerable and delicate gums. But beyond that, there is no mode that will improve the progress of teeth whitening. This is achieved by various other products, which unlike toothbrushes, have been tested and proven to do so. In our opinion, the average toothbrush user does not need more than 2 modes. Especially, when the maximum speed of the sonic toothbrush reaches 31,000 brush strokes per minute. Our experience, surveys, and research also show that after a period of 4 months, most people forget that there are 3 or more brushing modes. Not to brag, but we have spent some considerable time working on this list. All features mentioned above are current as of February 25th, 2017. But, they are subject to change, as we have no control over what the manufacturers do, or choose to include in their models. It is best to always double-check the description before you make a purchase. Make sure you are getting the toothbrush with the desired settings and features. Most brands, Philips included, have a 90 day grace period. Which means, you can still return or exchange the sonic toothbrush if you realize you have not made the right choice. We strongly advise that you take advantage of this warranty. Sonicare Toothbrush Blinking Green Light - What Does It Mean? Nice description of toothbrushes and features. Thank you. I would suggest something other than Phillips. Paid over $100.00 BJ’s, and after 7 months the charger stopped working. You would think they would want you to continue to use their product and offer a replacement charger, but you have to buy another at an approx $30.00 cost with shipping. By the way customer service is not too friendly. Need to buy 2 more brushes and will buy another brand. 1.1 Who will benefit from this list? 1.2 Which brands and models did we evaluate? 1.8 How do we define “best”?